Let the record show, I was never fooled by the dark eyebrows of some of those impostors. They were much younger men pretending to be old men. And they probably weren’t properly jolly, either. I’ll never quite understand what my parents were thinking that year. We went to a mall we never went to before, but I had to assume there was some kind of plan. We stood in line like normal. The only odd thing was I wasn’t used to seeing quite so many black people around me, where I was from. But I knew we were just in a different city, and a different mix of people lived there. I was sure it didn’t matter. Before too long, we standing in front of a man who looked remarkably like Santa Claus. Except he was black. I was astonished. It had never occurred to me in all my—what?—10 or 11 years that such a thing could happen. A black Santa? It made me angry. What were they doing? Then I remembered: Back in the line we had come to a fork, and we were made to choose right or left. Was there a white Santa in the other direction? Was it too late to change our minds? I was desperate. Who could we talk to about this? I began to panic. I looked up at my parents, hoping for an explanation. Hoping that they were as uncomfortable as I was. They were expressionless. I looked at the other families. Were they mad that we were here, intruding? Were we busting in on their Santa territory? Again, no one seemed to be having any sort of reaction to any of this. I guess it made sense, in a way. There were probably some very good reasons for little black boys and girls to want to see a black Santa. So … fine, I thought. 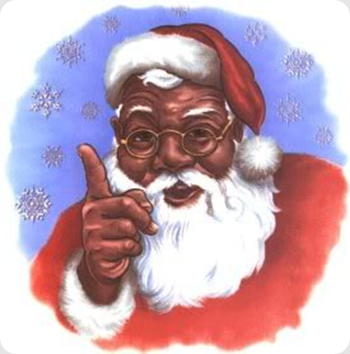 Let the little black boys and girls have a black Santa. But what about my poor brother and sister? We needed a white Santa. This was just … weird. Santa was white last year. How do we explain this? I mean, yes, of course Saint Nicholas was from Turkey. Somehow the Europeans got him and made him into some sort of mythical snowy-bearded reindeer herder. Along the way, he took up residence at the North Pole. Then you throw in a furry red cape and a cadre of elves … and it all begins to break down a little bit. If there were things to explain about Santa, the least of our worries should be his skin tone. And there it was: My first experience with White Guilt. Why is my brain spinning out over this? I thought. It shouldn’t matter, right? Why should white folks have a hold on Santa Claus? I’m. Such. A racist! Bobby and Lauren sat on his lap and told him their hopes and dreams. And nobody seemed to be bothered. Santa was happy. Bobby and Lauren were happy. Mom and dad were exhausted. I began to calm down. I was too embarrassed to ask my brother and sister what they thought about it. I was desperate to avoid any “is he real?” conversations. Best to let Mom and Dad deal with that one. So I still don’t know how they made sense of it—or if it even mattered to them.